Proposed concept to create a new main entrance, vestibule, foyer and gathering space for the congregation. An important objective was to maintain visibility of its signature stained glass window of Saint Elizabeth Seton yet provide a new and inviting presence on the street. 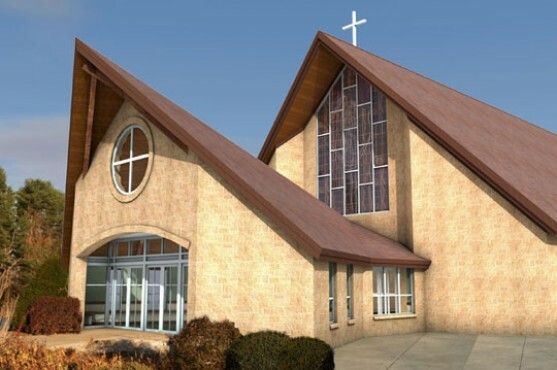 The tipped roofline presents a strong and inviting gable entrance yet leaves the stained glass window fully visible as people move along the road and around the site. There were multiple design objectives to accomplish in a small package and this compact solution (less than 1,000 SF) seems to satisfy them in an elegant way.